By CNN'S CARMA HASSAN, TAYLOR WARD AND JUDSON JONES CONTRIBUTED TO THIS REPORT. (CNN) - The three wildfires burning in California are devouring acres of land at a terrifying speed due to strong winds and extremely dry ground conditions created by climate change, authorities say. At its fastest, the Camp Fire in Northern California spread at more than a football field a second, or around 80 football fields per minute. It burned through 20,000 acres in less than 14 hours on Thursday. By Monday, it had reached 113,000 acres. The Woolsey Fire in Ventura and Los Angeles counties doubled in size in a 90-minute period Friday morning, to 8,000 acres. By Monday morning, it was up to more than 91,500 acres. The Hill Fire in Ventura County has torched 4,531 acres. In Southern California, the Santa Ana winds pushing the fires are expected to remain strong in Ventura and Los Angeles counties through Tuesday, CNN meteorologist Dave Hennen said Monday. In fact, the strongest winds for Southern California may come Tuesday and could reach near-hurricane gale force, he said. These winds, which began in the middle of last week, may last through the end of this week. In Northern California, the offshore winds that had been whipping the area for days are expected to die down Monday, Hennen said. The classic offshore flow was similar to the Santa Ana winds. Though the drought in California has eased somewhat, all of the state is still abnormally dry, CNN meteorologist Taylor Ward said. That makes a lot of dry vegetation for the fires to burn. "It kind of lined up perfectly to have the large 90,000-plus acre fire run we had (Thursday)," Chavez said. "Fuels will continue to get drier and drier and drier until we do finally get a season-ending rainfall event." Climate change is not directly causing the fires to spread quickly, but it has created conditions conducive to feeding fires -- such as drier air and plant life. That's contributing to more days of extreme fires, CNN meteorologist Brandon Miller said. CalFire says the five most destructive fires in California history have occurred since 2015. The organization has been keeping statistics for 100 years. The list does not include the Camp Fire, which would top the list. And a Columbia University study released in 2016 says human-induced climate change has doubled the area affected by forest fires in the Western United States over the last 30 years. 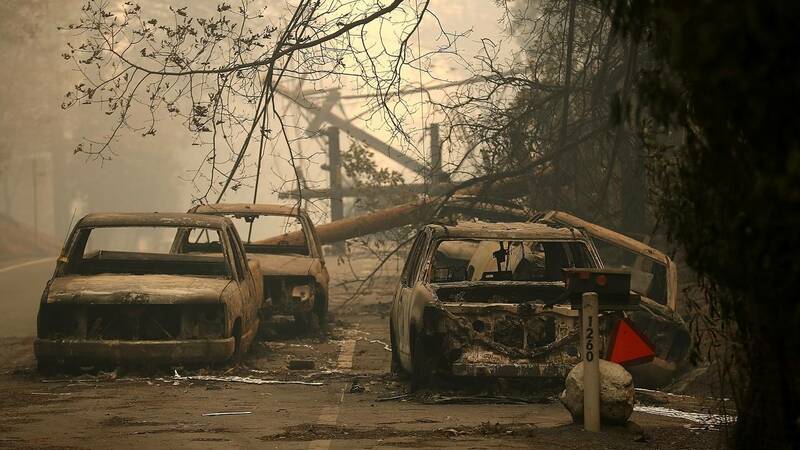 California's fourth climate change assessment, issued last August, said the state's forests will become more vulnerable to wildfires because of climate change. CORRECTION: An earlier version of this story incorrectly reported the state's number of most-destructive fires that have occurred since 2015. It is five, not including the Camp Fire.